Educational and community opportunity in their restoration as a group. HISTORICAL - the background of each bell. Research historical school records, newspaper articles, pictures in their original locations. This could be done, bell by bell by student groups, and presented to the area. This is much the same as done by historical groups in the area. Also a picture of the frame formerly used to display these bells. Two-thirds of all American bronze bells were made in Watervliet and Troy by the Andrew Meneely, Chester Meneely and Jones bell foundries, all represented in your collection. EDUCATIONAL - Researching bell making, foundries and bell playing. Some interesting thoughts and potential uses. 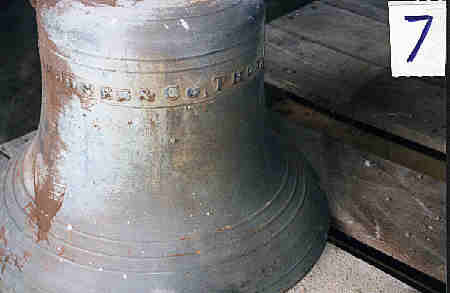 Each bell, besides representing its original school could be labeled with another significance, i.e., the kindergarten bell, the grade school bell, the junior high bell, the senior high bell, the senior class bell, the parents' bell, the sports bell, etc. This might create an interest beyond a static monument. With eleven bells, there is the possibility of playing or using them with a purpose. One bell allows an hour-strike. Four bells of correct pitches can allow a quarter hour Cambridge strike. 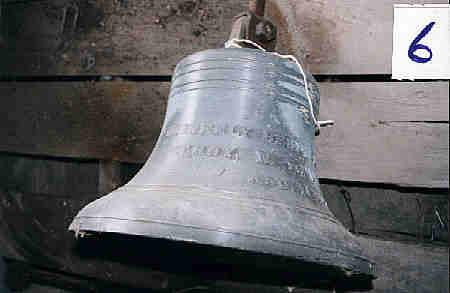 Four, six or eight bells can accommodate change ringing. Six or more consecutively tuned bells can accommodate a chime to play tunes. The combination of brass and steel bells ringing would be unique. These bells can sow a seed that will lead to future appreciation or involvement by graduates with bells in the thousand bell installations across the United States and Canada. 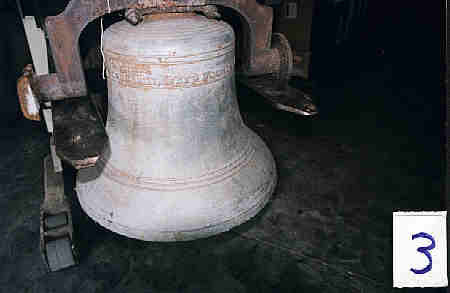 RESTORATION - would require some clappers, additional hardware on some bells and minimal cleaning. Also test for the mixing of bronze and steel bell sounds. MOUNTING - for the uses that are settled on would be a challenge that Shen and the community would be proud of. The picture you sent of the old display show an arrangement of bells that is absolutely perfect for all of these possible uses. In addition, it allows the touching of the class bells, which I thought too forward looking to mention. Meeting at Guidance office with Kevin Daley, Greg Mayo and 8 others, 6 pm. 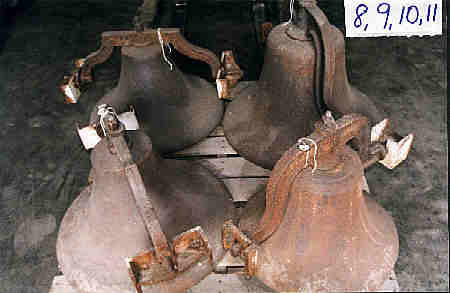 Picture of previous ‘L’ layout with 6 bells hung, and 5 bells on the bottom. Historically speaking, a similar exposition would be preferable. Practically speaking, it is probably the best way to go. Bells should be able to swing, if possible. - Inside clappers would ring. Bells should have clappers and be able to be played that way. Plaque might have original school, manufacturer, year, (weight), and note of each bell. Each bell might have a newer significance beyond its roots. Greg Mayo and Joe Connors to research basic bell facts, restoration, cleaning and mounting. Shen Warehouse – used fork lift, pitch pipe, Korg chromatic tuner, cameras, small tools. 1. Steel, F-, ‘20’ on top, 20”dia, May be C, other tone might have been hum tone. Also checked into steel protected coating. Dupont, $80/gallon with portion activator. Available at Passano Paint, Watervliet. Meeting at Shen District Offices with Kevin Daley, Greg Mayo and 8 others, 6 pm July 21, 2004.
. Sand blasting steel parts (cover brass).
. Check for adaptability roller bearings (swinging).
. For swinging (tolling), would need roller bearings on frame.
. Put up picture of "A" frame to show one roller bearing setup.
. Could we build and swing out a rack to allow ringing?
. Security for ringing and theft.
. Possible Shen technology dept. involvement.
. Meet with Bob Horan, Greg, Joe on Wed July 28, 2004 at warehouse at 9am. 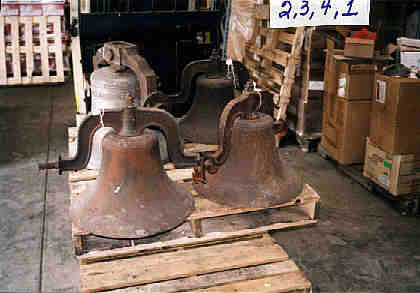 Great newspaper article on these bells by Dennis Yuskoin in two papers in March 2005.